As we near our fifth birthday this year, we’ve met a lot of great people along the way. Some of you have been with us since the beginning, and many of you we’ve met since then. After opening in 2013, we have brewed over 120 different beer styles, grown our production three-fold, added the wonderful Reilly family to our ownership circle, increased our payroll to nine, began distributing through Central and Eastern Nebraska, hosted over a 100 (yes really!) events and even won a few awards for our beers. It has been an incredibly rewarding trip for us. Without our SBC family and our customers, however, none of it would be possible. So we are planning to recognize those that have helped us along the way. 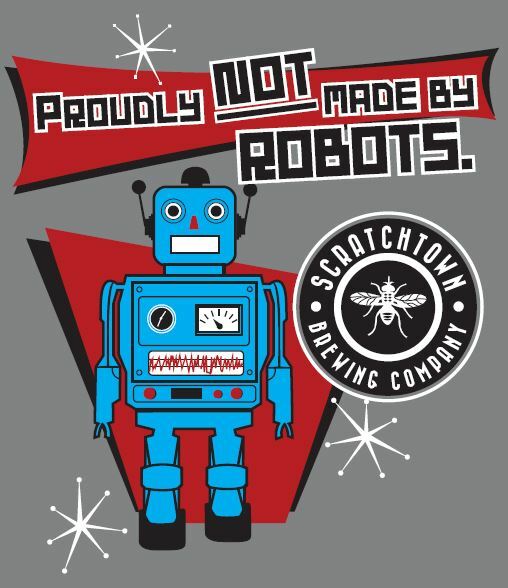 “Proudly Not Made By Robots” was a cheeky t-shirt design we launched our first year, but it was also a mantra we’ve carried since the beginning. We did then, and continue to do, operate the old fashioned way. We brew and bottle by hand. Owners work our taproom, events and festivals side-by-side with our staff. We often break bread with our customers on the other side of the bar as well, acknowledging that without our community of Ord, and our community of dedicated beer drinkers, we’d have nothing. We believe it is essential to share the stories of the individuals that have helped us get here: our SBC family and our customers. We believe great people create great companies and we want you to know who they are. They deserve to be recognized! So in the coming months, stay tuned for stories from Scratchtown. We hope you enjoy reading about the great people that make our world work, because we appreciate them greatly! Updated: check out the PNMBR features on each member of the SBC family below.